So What Is Contour Line Drawing? Contour line drawing is a slow study of a model’s anatomy. Our sense of touch is the underlying principle of drawing these lines. Let me explain. You've probably seen a movie in which a blind person wants to know what someone looks like, so they ask if they can run their hand across that person’s face. When you’re drawing, imagine you are running your pencil across the model’s face and the model’s body. Just as a blind person feels the shape of a person’s face, with practice you will be able to feel the shape of the model’s face and body with your pencil. Contour line drawing requires that you keep your eye on the model, not on the paper. Imagine that the pencil is touching the model instead of the paper. Then slowly move your eye across the contours of the model and allow your eye to pull your pencil along with it. Here are some contour drawings of the female figure. As in gesture drawing , this will take some practice but the results are worth it. It is inevitable that if you are really letting your eye guide your hand , the resulting line art drawings will be lifelike and expressive. Just be patient and allow yourself to make "mistakes". The importance is the process, not the final product. If you stick with the process, success will follow. Once you learn how to do contour line drawings correctly, you will see how much can be expressed just through lines. The lines themselves will imply the three-dimensions of objects and the bulk of human figures. 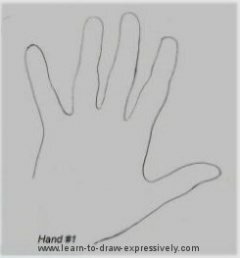 This is a drawing of my own hand, which I did for instructive purposes. Look at Hand #1. It could be your left hand, palm facing towards you, or your right hand, palm facing away from you. Contour lines include not only the outlines, but also the important definition lines that lay within the outline. 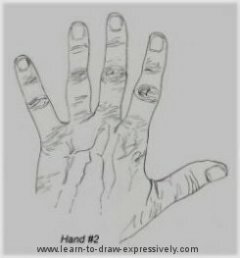 Once you introduce contour lines as in Hand #2, there is no question that it is your left hand, palm facing away from you. Those lines imply veins, knuckles, and natural skin texture or natural wrinkles in the hands. The lines not only describe what it is, but they give it a 3-D or three dimensional quality when you draw the lines in the right places. Once you have practiced enough contour drawing, you will naturally internalize them, and they will subconsciously become a part of every drawing you do. The resulting line art drawings will be lifelike and expressive.